Hello all! 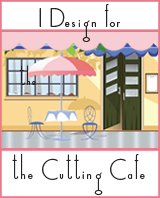 This week for The Cutting Cafe design team, I used the Sewing Machine Set which contains a card and a box version. I made two thank you cards, appropriate for any time but especially now. Hey Everyone! I am here to share a couple new stamp sets that are available from The Cutting Cafe Shop, which is the sister store to The Cutting Cafe. These are great for all those birthday cards that you need to make and also for layouts or other projects. I pulled out my embossing powder, which I haven’t used in eons and stamped the background using the Birthday Party Background stamp. I used one of the frame cut files that comes with the stamps and put the stamped piece on foam tape for a little dimension. The paper had copper foil, so I used copper embossing powder. The heart balloon and party hat are made from the Birthday Party Fun stamp set and outline cut files that come with it. I embossed those also. I like the way these came out. Make sure you also check out the shop as Regina is now doing custom stamps! Yes, that is correct. If you want to get a special stamp made, just provide the artwork and submit it with payment. Check out my video below to see more about the project, the stamp sets I used and the custom stamp set made for me. Thanks for stopping by! Today I am featuring the new clear stamp set, Everyday Elisha Jean & Friends, from The Cutting Cafe Shop which is the sister store to The Cutting Cafe. Regina, the owner, has translated some of the printable stamps from the original store into clear stamps. And when I tell you they stamp so smoothly it’s like butta, I really mean it. I used a firework paper to cover the notebook, added bling, the word dream, and Elisha Jean, the cute doll stamp. The sentiment also came from the set. I paper pieced her dress, bows, and socks. i covered the inside covers with hot pink glitter paper. I stamped the girls on every few pages. Here is the first one.